Experiencing more JOY is high on most everyone’s list of desires. 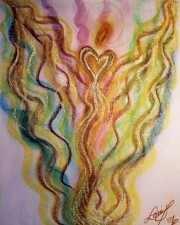 The Golden Rainbow of JOY Angel tells us, “to attract more joy we must understand that every thing is occurring in perfect timing.” Rather than getting caught up in the drama of the “what ifs” and “shoulds”, we need to focus on being more “in the moment” and find peace in the knowledge of divine order. She reminds us that hurrying and trying to force things to happen is futile. Instead watch for the doors that are opening and walk through them with grace and ease. If an opportunity presents itself and it feels right, allow it, even if you don’t know where it will lead. 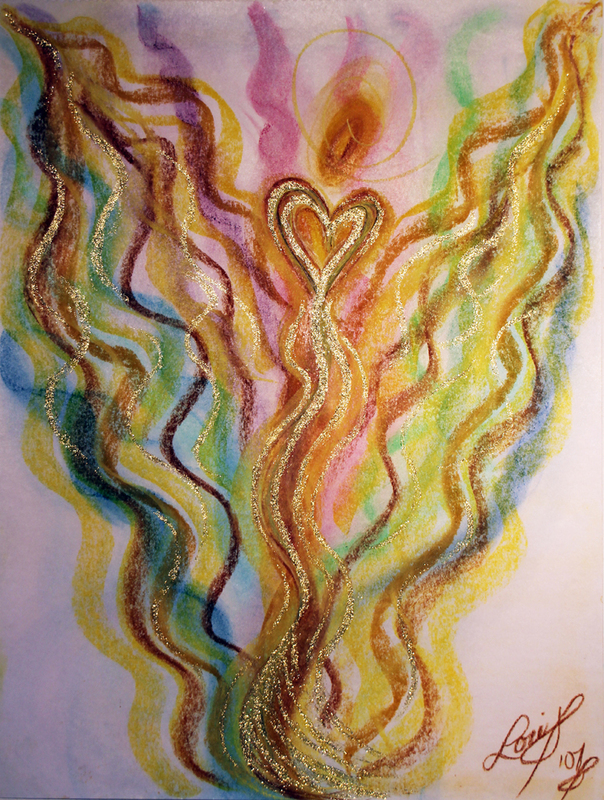 This beautiful angelic artwork, was created by Visionary Artist and Angel Communicator, Lori Daniel Falk, to help us understand that every thing is occurring in perfect timing. Rather than getting caught up in the drama of the “what ifs” and “shoulds”, we need to focus on being more “in the moment” and find peace in the knowledge of divine order. 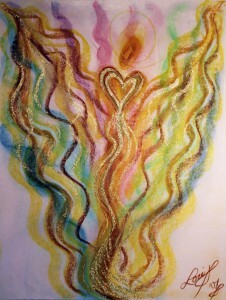 Pastel Chalk with Gold Glitter effects on paper.